Loudonville, NY Incumbent Democrat Andrew Cuomo’s lead over Republican Marc Molinaro, the Dutchess County Executive, narrowed from 22 points last month to 13 points this month. Cuomo leads 49-36 percent, down from 50-28 percent in October. Minor party candidates are supported by seven percent of voters, with seven percent still undecided, according to a new Siena College poll of likely New York State voters released today. Senator Kirsten Gillibrand holds a 58-35 percent lead over Chele Chiavacci Farley, down from 61-29 percent in October. State Comptroller Tom DiNapoli leads Republican Jonathan Trichter 62-25 percent, up from 58-26 percent. The race for Attorney General has Democrat Tish James, New York City Public Advocate, leading Republican Keith Wofford 49-37 percent; it was 50-36 percent last month. Farley, Trichter and Wofford are all first-time candidates. “Women continue to favor Cuomo two-to-one, however men now tilt toward Molinaro after supporting Cuomo by 12 points last month,” Greenberg said. “While Cuomo largely held his base – Democrats, New York City voters, women, black, Jewish, and younger voters – Molinaro picked up with Republican and independent suburban and upstate men. “Three third-party candidates divide support from seven percent of voters. Last month, before Cynthia Nixon left the race, the third-party candidates attracted 14 percent, with the lion’s share going to Nixon,” Greenberg said. 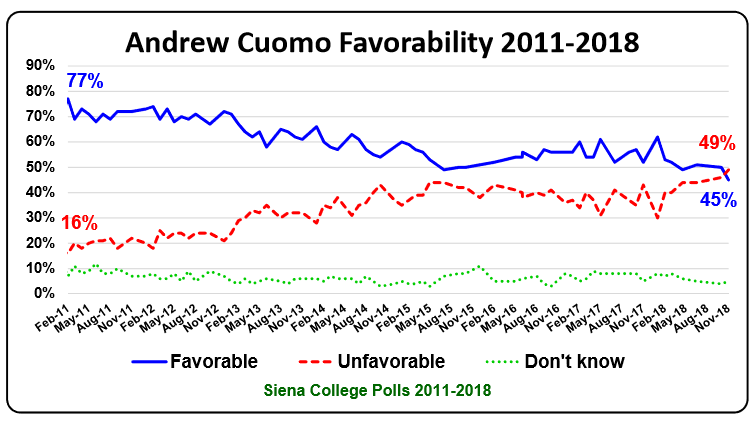 “For the first time since he’s been governor, more voters now view Cuomo unfavorably, 49 percent, than view him favorably, 45 percent, down from 50-46 percent last month. While Democrats and New York City voters overwhelmingly view him favorably, Republicans, independents and upstate voters overwhelmingly view him unfavorably,” Greenberg said. “ Molinaro continues to be largely unknown to nearly half the electorate, with a 29-25 percent favorability rating, compared to 24-20 percent last month. “Voters are poised to give Cuomo a third-term. The question appears to be by what margin? Will Democrats and New York City voters turnout in bigger numbers than they have in recent midterms? If so, Cuomo has the chance to run up the score. 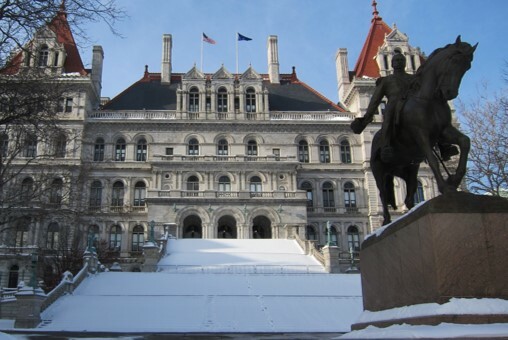 If not, or if Republican enthusiasm matches increased Democratic enthusiasm – particularly in upstate and the suburbs where there are hotly contested House and State Senate races – then the final results will likely look similar to four years ago,” Greenberg said. “Gillibrand’s favorability rating, 46-34 percent, fell a little again this month, and voters give Gillibrand her highest unfavorable rating in eight years. Farley was unknown to 89 percent of voters in February and remains unknown to 86 percent of voters on the eve of the election,” Greenberg said. “Gillibrand gets 90 percent support from Democrats, picks up 20 percent of Republicans and splits independents with Farley. Gillibrand is supported by more than three-quarters in New York City, and leads by nine points upstate and in the downstate suburbs. “James and Wofford continue to battle it out in the only statewide race with no incumbent. But little has changed in the basic dynamics of this race over the last month. Both candidates are running strong with their party’s voters and independents who had tilted slightly toward James, now tilt toward Wofford by four points,” Greenberg said. “James’s natural advantage in New York City – overwhelmingly Democratic and where she’s won two citywide races – continues to be the difference in this race, as she has support of nearly three-quarters of voters there. However, outside of the City, Wofford has a slim lead among suburban and upstate voters. By 56-41 percent, virtually unchanged over the last several months, voters say they want to see the House of Representatives controlled by the Democrats next year and by 53-42 percent, also little changed over the last several months, they want Democrats to control the State Senate. “In this era of sharp partisan divide, Democrats and Republicans agree – almost unanimously – on one thing: they want their party to control the House of Representatives and the New York State Senate next year. Independents are evenly divided on the House question and very closely divided on the State Senate question,” Greenberg said. 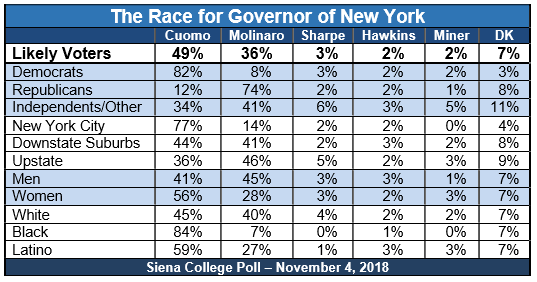 This Siena College Poll was conducted October 28-November 1, 2018 by telephone calls conducted in English to 641 likely New York State 2018 general election voters. Calls were made to a sample of registered voters. It has an overall margin of error of +/- 3.9 percentage points including the design effects resulting from weighting. Sampling was conducted via a stratified dual frame sample of landline and cell phone telephone numbers from the L-2 Voter list. A likely-to-vote probability was computed for each respondent based on both their stated likelihood to vote as well as by virtue of the imputation of a turnout probability score based on past household voting behavior. This probability to vote was applied as a weight along with a weight that considered historic party by region turnout, age and gender. The Siena College Research Institute, directed by Donald Levy, Ph.D., conducts political, economic, social and cultural research primarily in NYS. SCRI, an independent, non-partisan research institute, subscribes to the American Association of Public Opinion Research Code of Professional Ethics and Practices. For more information, call Steve Greenberg at (518) 469-9858. For survey cross-tabs: www.Siena.edu/SCRI/SNY.